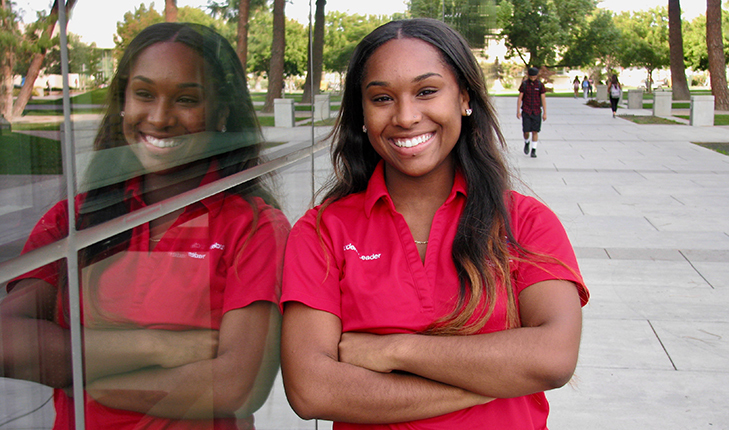 Inez Hill, a Fresno State junior, grew up in southwest Fresno and attended Edison Computech and Edison High School. That background helps inspire the service work she has done with young people in her community there. Hill has worked with Fresno Street Saints, an organization that works to make southwest Fresno a safe and healthy community. She helped create the Resiliency, Aspiration, and Perseverance (R.A.P.) Program, which provided high school students with lunches, craft activities, projects design and workshops over summer break. She also volunteered in Fresno Street Saints’ two-month leadership class where high school students developed plans for how they could take on a larger leadership role within their community. Her work on these projects didn’t go unnoticed. Each year, Campus Compact – a Boston-based nonprofit organization working to advance the public purposes of higher education – honors college students, naming them Newman Civic Fellows. This year’s cohort will include Hill, a psychology major with a minor in public health. The Newman Civic Fellowship is a one-year experience emphasizing personal, professional, and civic growth for students who have demonstrated a capacity for leadership and an investment in solving public problems. Hill is one of just four students in the 23-campus CSU system, and one of 262 nationwide to receive this honor. She sees the work she has done in the southwest Fresno community as providing more opportunities for young people in southwest Fresno, including her younger sister and brother. Hill also devoted time designing program curriculum for middle school students and spent time each week in the classroom discussing higher education with them through the Fresno State Pipeline Program. Hill’s involvement as a Newman Civic Fellow will take place during the 2019-20 academic year, and will include a variety of learning and networking opportunities. Each year, fellows are invited to participate in a national conference of Newman Civic Fellows in November in partnership with the Edward M. Kennedy Institute for the U.S. Senate. The fellowship also provides fellows with pathways to apply for exclusive scholarship and post-graduate opportunities. Taylan Bennett, special projects coordinator with the Jan and Bud Richter Center for Community Engagement and Service-Learning, works closely with and is an adviser to Hill. Bennett recommended that Hill be considered for nomination.